On Mardi Gras, Vianne Rocher and her daughter Anouk, two wanderers who have spent their lives roaming from place to place, arrive in Lansquenet-sous-Tannes, a small French village. They enjoy the festival and decide to stay, so Vianne rents a house and opens a chocolate shop just in front of the church. This decision doesn’t go down well with the village priest, Father Reynaud, who thinks that opening such a shop at Lent, a time of fasting, is an insult, and a menace, to religion. He also doesn’t approve of Vianne because of her refusal to attend church or confession, and convinces some of his parishioners to stay away from the “evil” chocolate shop. Despite this, the shop attracts a few customers from the very start. Not only has Vianne a knack for figuring out what each clients’ favourite type of chocolate is, but she is also a good listener who makes everyone feel welcome. The 80 year old woman who never conformed to the rules of the small village, the woman who’s abused by her husband, an old man with a dying dog, are just some of her regular clients. Vianne talks to them and asks them questions that makes them challenge their beliefs, in an attempt to try and make their lives better. Because of this, you can say that she’s the catalyst for change. Further problems arise when the river gypsies pull up and stop along the river bank by the village. The gypsies, who aren’t hurting anyone, are immediately befriended by Vianne and her friends, while the priest is ready to resort to any means, albeit illegal and dangerous, to get rid of them. Religious people may not find Chocolat very enjoyable. The Catholic faith is described in a very negative way here and is often under attack. The contrast between Vianne and Reynaud can also be seen as a contrast between laicism and Catholicism, where the second is seen as a way to control people’s lives, instead than something that can enrich and help them. Although I’m a Catholic, this didn’t prevent me from enjoying the book. I was a bit irritated by the fact that the author tends to portray religion in such a bad light, and is clear that her knowledge of Catholicism is limited and stereotypical, but at the same time it just can’t be denied that priests like Reynaud, who are more interested in making sure that the rules of the Church are strictly and blindly obeyed, to the point of telling a woman who’s constantly beaten up and abused by her husband that she should stay with him no matter what and to consider anyone who doesn’t follow its precepts an enemy to send away or destroy, exist. Reynaud’s attempts to sabotage Vianne’s shop or to drive out the gypsies from the village, even though they haven’t committed any crimes, aren’t Christian. Christ has taught us that we are all brothers and sisters and we should get along, and even love our enemies, not fight against those who don’t hold the same beliefs as us. Reynaud is, in short, one of those priests who give the Catholic faith a bad name and I agree that Vianne and her friends were right to fight him. However, I would have enjoyed the book more if the author had represented Catholicism in a more comprehensive way, pointing out his merits and not only his faults. There is also a mystical element throughout the book. Vianne’s leaving a town when the wind changes, her ability to sense how people are feeling, her habit of reading tarot cards leads the reader to think that Vianne may not be entirely human. We can’t help but wonder throughout the book if Vianne is a witch or any other creature with a special power, but there doesn’t seem to be anything supernatural about her. She’s simply a very perceptive woman who has made very different life choices from everyone else. The book is written in the first person narrative from Vianne’s and Father Reynaud’s points of view. While this allow us to better understand their lives, their beliefs and their actions, it can also be confusing for the readers. The chapters don’t clearly state who’s talking about from the start, which means that sometimes you don’t immediately figure out who the narrator is. I was also surprised to find that Chocolat is set in modern times. Maybe it’s the movie, which I’ve seen before reading the book, that lead me astray, but even the portrayal of what life is like in a Catholic village is very outdated and clichè. Despite this, the book is well-written and a pleasure to read. I didn’t find the book particularly gripping, but interesting yes. It’s full of drama, clashes, romance, dark secrets and although the end is more open that I would have liked, it provides some interesting food for though. Overall, it’s an unusual read that I would definitely recommend. Chocolate by Joanne Harris is a delightful read. The many descriptions of chocolate alone will make your mouth water. 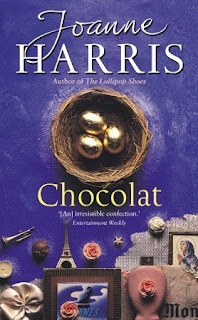 Vianne and her daughter move to a little village where she decides to open a chocolate shop during Lent. This leads to a bitter contrast with the priest, who sees her as an evil influence who’s trying to lead his parishioners to temptation and sin. There is a strong anti-Christian element in the book. Catholicism is portrayed in a superficial, stereotypical way, which may spoil the story for religious people. However, the book, which is full of clashes, drama and romance, also poses some interesting food for thought, and is very well-written.